If there’s anything you can be sure of with Blizzard it’s that their maps will be gorgeous. The Overwatch developers have an eye for detail, whether it’s the framed photos behind the counter of the Route 66 diner, or the 16-bit arcade machines in Hanamura. However, whether a new map from Blizzard will bel designed well from a gameplay perspective is something else entirely. 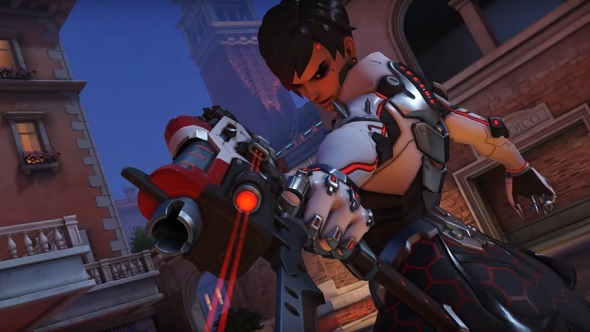 It’s about time Overwatch got a single-player campaign. The most recent maps added to Overwatch’s roster, Junkertown and Blizzard World, both leave a lot to be desired. The first Junkertown point is about as close to an open field as you can get, while its second and third points are disappointingly linear, with few branching side-passages. Due to how direct it is after the first point, Junkertown is more susceptible than most to the dreaded pirate ship strategy – where a Bastion and Torbjörn stay on the payload and are protected by tanks and healers – due to the lack of flanking opportunities. Blizzard World is a self-congratulatory triumph of visual design, and a real treat for long-time fans of their game library, featuring rides and attractions that reference StarCraft, Diablo, and of course, World of Warcraft. The map design is solid but not stunning. It sags, especially in the middle, where the lack of viable flanking options creates uninteresting bottlenecks. 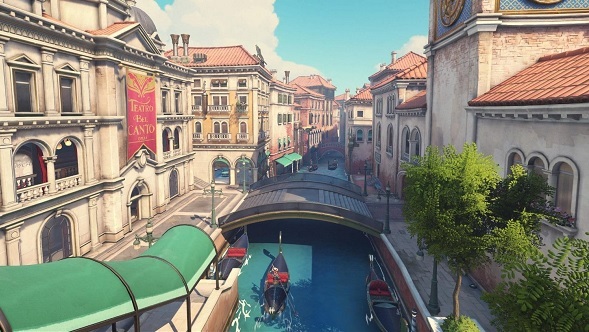 Does Rialto trump Blizzard’s latest couple of maps? Yes. Yes it does. For starters, it’s probably the best-looking map yet. It doesn’t have the gimmicky glory of Blizzard World, but the lighting and architecture are wonderful. If you played the nighttime version from the Retribution PvE mode you’ll find it looks even better in the day. If you remember the PvE version then you know the basic layout of the map, but it’s been tweaked significantly. The hall where the Retribution mode starts is where the defenders spawn, but it’s larger, with fewer obstacles and more side entrances. The attackers start in the circular room near the end of the Retribution mission, and attack over the bridges. What you should realise as you play Rialto is that the layout is excellent. It’s a maze of side corridors, buildings, and flanking positions separated by two major choke points – one after the first point, another after the second. The bridges provide ample opportunities for environmental kills and the striking Venetian architecture has an enjoyable two-level setup. Sightlines are created generously throughout, ensuring that snipers don’t get free reign over vital bottlenecks. At the moment, attackers have a slightly easier time of it in casual play, but that will likely change once everyone has had the chance to learn the nuances of the layout and work out optimal defensive positions. It’s a great map all round, and we can’t wait for it to hit the OWL scene so we can see how the pros approach it.